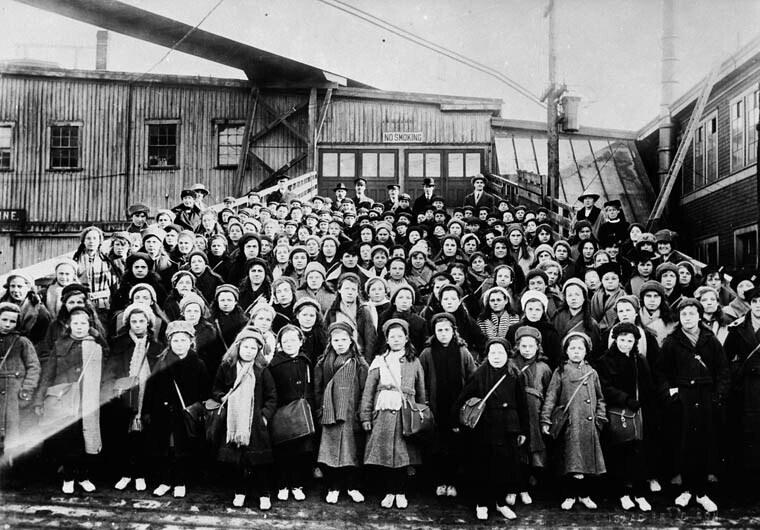 British immigrant children from Dr. Barnardo's Homes at landing stage, Saint John, New Brunswick. Library and Archives Canada (LAC) holds unique and extensive records about British Home Children, such as passenger lists, Immigration Branch correspondence files and inspection reports, non-government collections such as the Middlemore Home fonds, as well as indexes to some records held in the United Kingdom. The records also include names of older boys and girls who were recruited by immigration agents in the U.K. for farming and domestic work in Canada. Please note that most documents have been created in English. Members of the British Isles Family History Society of Greater Ottawa (BIFHSGO) and other volunteers are indexing the names of juvenile migrants found in these records. Children of the State by Florence Davenport Hill, 1889. Before 1892, immigration operations were under the jurisdiction of the Department of Agriculture. The Central Registry files include correspondence between the Immigration Branch and various sending organizations. Files that include lists of names have been indexed in our Home Children Records database. These files contain correspondence from and to various sending organizations. They often include annual reports, information booklets and some lists of names of children. The files cover the years from 1892 to approximately 1946. Consult our Guide to Sending Organizations and Receiving Homes for relevant references and information about how to access those records. Immigration officials created inspection report cards as they carried out regular inspections of children brought to Canada by various organizations. These records date from 1920 to 1932; however, there are a few from 1911 to 1917 and after 1932. There is usually one page per child, showing name, age or date of birth, year of arrival, ship, sending organization, the names and addresses of employers and final comments, e.g. "completed, gone west". The inspection reports are available on the following microfilm reels, which can be viewed on site. The records are arranged in alphabetical order, not by organization. Note that the original records have not survived and the quality of the microfilm is poor. These reels are digitized on the free website Héritage. Enter the reel number in the search box, then click on the reel title to see the images. The contents are not searchable by name, but you can skip ahead through the images to find the relevant section of surnames. Besides the following websites, consult our Guide to Sending Organizations and Receiving Homes for resources in Canada and the British Isles relating to specific organizations. Archives of Ontario: Toronto Emigration Office Records: Includes inspection reports for some British Home Children. British Home Child Group International: Includes a database and other resources. British Home Children in Canada (BHC): Includes digitized copies of Ups and Downs, the British Home Children Registry, British Home Children Burials and many other resources. British Isles Family History Society of Greater Ottawa – Home Children: Includes Home Children Deaths index and other resources. Home Children: Includes some transcribed lists. Young Immigrants to Canada: Includes some transcribed lists. Ancestry (subscription required): Includes indexes and digitized records for England, including census and some church records. Ancestry is available free at many public libraries. Familysearch: This free website includes indexes and some digitized images for many records from England, including census and some church records. Also use the Catalogue to find out what records are available on microfilm. Former Children's Homes: Information about Cottage Homes, orphanages, and other institutions. FreeBMD: These indexes to British birth, marriage and death records indicate the quarter of the year in which the event was registered, not the date of the event. The references also provide the registration district, volume and page number for ordering copies. The actual records are not online; they must be ordered from the General Register Office (GRO) in England. London Metropolitan Archives: The LMA holds registers of School Admissions and Discharges, 1840-1911, for the London area. Many of those records are indexed by name and digitized on ancestry (subscription required). The Children's Homes: Information and resources about orphanages, homes, reformatories, industrial schools, training ships, and hostels. The National Archives: Use the Guides and the Discovery Catalogue to search for records relating to various organizations and workhouses held at the National Archives and other archives in the British Isles. The Workhouse: Historical information about Union workhouses, schools and homes, including information about where to locate records. You can search the website by a place name or other keyword. You can also access relevant information by clicking on Workhouse Locations.